Using a pair of color triads, one high intensity and one low intensity, can lead to surprising results on the canvas. This is a set of two triads, the first with a high intensity chroma and the second with a low intensity chroma. This seems like a lot of repetition. But what I found is that rather than trying to subdue a color that was too intense, I used its low intensity version. An example would be an orange made with Cadmium vermilion + Cadmium yellow + White vs. English red + Raw sienna+ White. I also made a decision about the quality of the light source. 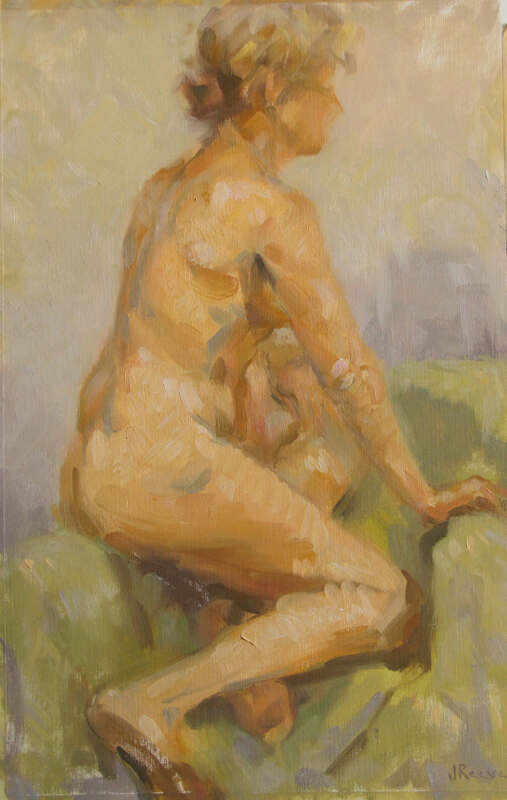 While painting this figure study, the model was illuminated by an electric incandescent light, with a cooler sky light above. In this situation, the intensity of color came from the incandescent light. This left the shadows more neutral. There was also the play of a cooler light on the top planes that added some neutrality and temperature variation on the light side as well as the shadow side. So in using this palette, I decided that the light side should contain the most intensity and therefore used the high intensity chroma triad to express the primary light source. And I used the low intensity chroma triad to express the shadow side and all receding planes including the background. This gave an immediate feeling of projection to the forms of the figure. The exception being that the triads intermingled in the neutrals along the shadow edge and the reflected light on the top planes on the shadow side. I found that adding a touch of cobalt blue and English red to the top planes on the shadow side united the two triads perfectly through the cobalt blue (high intensity palette) and the English red (low intensity palette). This arrangement of the palette with its primary concern for the light source and its quality of intensity and color temperature was very successful. I have yet to experiment with the reverse situation, where the light source is cooler and most of the color intensity resides in the half tones and shadow side. But I believe that it will work in that situation as well, as long as I consciously organized and decipher the quality of light on my subject and use the palette accordingly. Your intuition is correct. You can use multiple chords that are related in the same canvas. It is tricky though because you need to create a hierarchy with the chords. Both Robert Henri and George Bellows used what they called a Triad of Chords. There will be a Tonic Chord followed by the Dominant Chord followed by the Sub-Dominant Chord. To make this triad: You take the last color of the first chord and make it the first of the second chord. Then, the first of the third chord is the color note which, in the ordinary scale of 12, follows the second note of the first chord. An example: R-Y-GB; GB-VR-O; YG-BV-R. But in order to make this work, the first chord needs to dominate. The second chord will be slightly hidden and the third chord, more hidden still. One can achieve this through intensity. I can create a hierarchy of intensity with the greatest intensity in the Tonic chord, less intensity in the Dominant chord and still less in the Sub-Dominant chord. The best example of this triad of chords is George Bellows’, Cliff Dwellers. Each chord is separated by area, i.e. foreground, middle ground, background. Still, this is very difficult to master and both artists used it less frequently than other palettes. Good Luck! In the case of ro, bv, g.. the two cold colours amplify the ro. This sets up ro as the key note.. as Myron Barnstone described it: the ro soloist in a bv,g choir. It makes sense that the ro should be used sparingly and what’s more, any neutral placed into the ‘choir’ would take on a warm ro feel. There are a few points that puzzle me: If you wanted to amplify the red orange then you would not stray too far into neutrals with the bv, g. At least not within range of the redorange key notes. But if I think in terms of music, it’s not usually the first degree that acts as the jump out note.. or the Melody note. Perhaps in the first bar of a cycle, but in the kind of music I play I would more often look to the third(bv) as the melody note. The first would usually be supplied by the bass. Pervasive and deep. Pretty much the opposite. Apologies, I have a lot of thoughts and questions floating around and it’s difficult to package questions succinctly, but I’ll try! If you lose patience, then please let me know. So yes, how would you treat the ‘root note’ ro? Is it a sparsely used soloist or could it act as a pervasive colour? Does this in any way relate to what you were saying in terms of a supercolor? I’ve experimented ising using the root(ro) as the underpainting and painting cool on top. It does work of course, but yes it might interfere with the ‘solo notes’. The other thing that interests me is the use of melody notes at higher intensity, notes not necessarily in the chord. The problem again being that they clash with the ‘soloist’. In music this is all a question of timing right? Strong beats and weak beats. You can get away with much more off the beat. Of course if you want to apply all of this in a canvas, then you’re going to have to set up a passage of time.. like you said… something like foreground, middle, background. I suspect that by using root rectangles, Golden section or whatever you can set up a musical meter and this might be key in organizing this kind of system. I am aware that this is in danger of becoming too complex, and might be too distracting or rigid, but you know, sometimes you just want to know! In musical theory it’s not considered that complex, but in just surprised there isn’t so much written about this. Is that because it becomes too contrived or just because not many people have written about it? Or am I barking up the wrong tree?! Again many apologies.. a gushing of information! I live in China and have no one to talk about these things with! This is very interesting. One thing to remember is that music moves in a sequence. One cannot hear it all simultaneously. Nor would you want to. But with painting, the image is held in the mind all at once, in one glance. And therefore, has its greatest impact because of this.This makes painting unique. Both music and writing are sequentially understood and can only find their meaning for the mind in this way. Delacroix writes extensively about this in his Journal. These are all good thoughts. This is very Interesting. A great idea. I wonder how it would work on a seascape on a sunny day I would like to try it. The concept of a dual triad of varying intensities can work for any painting. Although the triads that I have indicated may not be the ideal combinations for a seascape. Having painted many seascapes, I find that I cannot do without viridian. You can get a very good green of high intensity with the cadmium yellow and the cobalt blue, but would it be cool enough without the use of white. I also like to make a blue hue of less intensity by combining a violet with a green (viridian). I am not saying that you cannot use the two triads as I have indicated, but you might be better served with a cooler yellow and an ultramarine blue in the triad of greater intensity and/ or the addition of viridian. Sargent – Use and Enjoyment of Colour. Sorry, a bit vague with the names. You recommend Delacroix’s note books?.. I haven’t looked at Chevreul’s writing… and I have read couple of times that Rubens might have written something or someone wrote about his work at the time. Couldn’t find a thing by Maratta.. there are titles, but nothing much online. Apart from that, just a few modern texts.. James Gurney, another artist whose name I forget… they talk a little about triads and have a couple of good points, but nothing substantial. I might start a blog at some point, so please take a look if I send you a link. Yeh totally agree about the time thing.. pictures are taken in at once.. to some degree… I think it can work though can’t it?… using passages that blossom into new triads. The idea is always better than the result though! I did try using three triads to make a series of paintings. It seemed to work really well.. somehow telling a story when there wasn’t really much of a story there, if you know what I mean. Just seemed to run with the momentum of a chord progression… beginning, cadence, ending.. the pictures were crude and not so good, but I could feel it none the less. You should definitely read Chevreul’s book, the Faber Birren version is good: The Principles of Harmony and Contrast of Colors.As regards Maratta, nothing of his work is published but he has a patent that you can access on-line as Maratta’s Spectrum Color Palette. There is also a short article in Scientific America where Maratta is interviewed about his color system. Another book to look at that was recently brought to my attention is Pope’s Intro to Drawing and Painting Vol I The Painter’s Terms. I hope this feeds your needs. Remember it is easier to read these things than apply them. They are also all inter-related.I was surprised when I read Sargent’s book which is contemporary to Ross and Henri that there were similar concepts being played with. The deeper you delve into them the more relationships you find.